and traditional hymns, accompanied by a tastefully blended band of musicians. Christian General Conference of America in Charlotte, NC. Pastor Steve is from NH, Cindy is from IN, they met at Zion Bible College in RI in 1979 and were married on June 26, 1982 and now have 3 grown children. Upon graduation from college Steve ministered as a Youth Pastor and together they were involved in Church and Christian School ministries on Cape Cod, MA from 1982 to 1987. In 1987 Steve was called to his home church as Associate Pastor. In July of 1989 Steve accepted the call to Pastor the Family Bible Church in Loudon, NH and has been here until the present. Steve has been involved in various denominational capacities including President of the local Conference of Churches, President of the Eastern Regional Association of Advent Christian Churches, serving on a Christian Conference Ctr. Board and local Christian School Board of Directors. Cindy has been on the church worship team, periodic Bible study teacher, counseling with women, and preaching on a number of occasions. Over the years while as a Pastor's wife, mother of three growing children and working full-time, Cindy accomplished becoming a Registered Nurse (RN) and more recently became a Board Certified, licensed Psychiatric Mental Health Nurse Practitioner. The ministry possibilities are wide open as to how the Lord may use her. 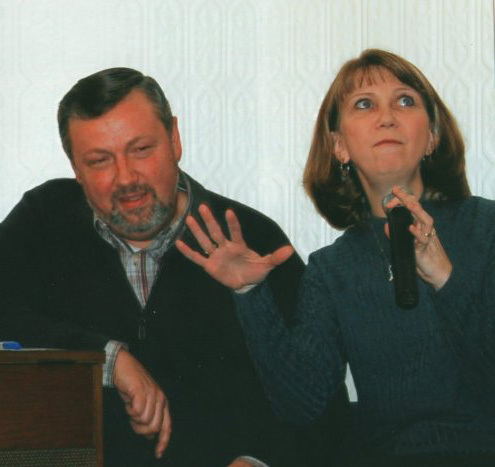 Individually and together Pastor Steve and Cindy are a caring ministry team, desirous of promoting and producing authentic followers of Jesus Christ, not just fans who line the sidelines or the pews but believers who are growing in their commitment to hearing God's voice and responding to His word. We are a warm and friendly, Bible believing/caring Church located on the northern edge of Loudon, NH off Route 106 on Loudon Ridge Road. Our worship service includes a blend of contemporary worship songs and traditional hymns, accompanied by a tastefully blended band of musicians. We are affiliated by denomination with the Advent Christian General Conf. of America in Charlotte, NC.